"A webfiction serial drama that casts uncanny shadows"
Strange and terrible things are about to happen in the town of Park Heights. Nothing will be left untouched, no-one will remain unchanged. For Tess Bellamy, who grew up here but could never get away, the coming events will challenge everything she knows about herself, her loved ones, and the people of this town. For Gabriel Majeaux, a world-weary drifter just passing through, all paths lead back to the war in the shadows he thought he had left behind. Dark Heights has not been tagged yet. Help others find Dark Heights by tagging it! Dark Heights has not been reviewed yet. 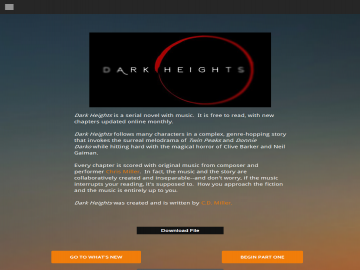 Dark Heights has not been recommended yet.